Your child has been diagnosed with autism spectrum disorder and you are not sure of where to go from here. Perhaps you suspected autism, but held out hope that an evaluation would prove otherwise. Many families report mixed feelings of sadness and relief when their child is diagnosed. You may feel completely overwhelmed. You may also feel relieved to know that the concerns you have had for your child are valid. Whatever it is you feel, know that thousands of parents share this journey. You are not alone. There is reason to hope. There is help. The Autism Speaks 100 Day Kit was created to help you make the best possible use of the next 100 days in the life of your child. It contains information and advice collected from trusted and respected experts on autism and parents like you. 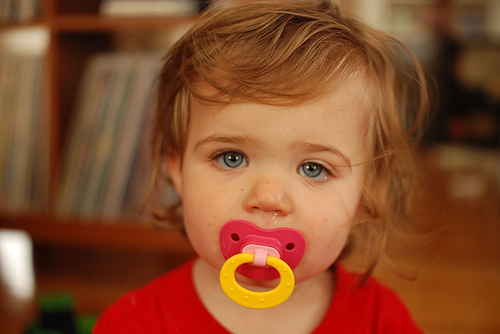 Early Intervention refers to services provided after a family has learned that their child has a delay or disability. For those infants and toddlers with a disability or developmental delay, providing intervention early and embedding activities within the families normal routines can make all the difference . Early intervention provides services and supports to promote the best possible developmental outcomes, and it enhances the capacity of families to meet their child’s needs. The Early Intervention Program for Infants and Toddlers With Disabilities, or Part C of the Individuals With Disabilities Education Act (IDEA), is a federal grant program that assists states in operating a comprehensive statewide program of services and supports for children birth through 2 years old with developmental delays, including children who are “at risk” of developing a delay or special need that may affect their development or impede their education. 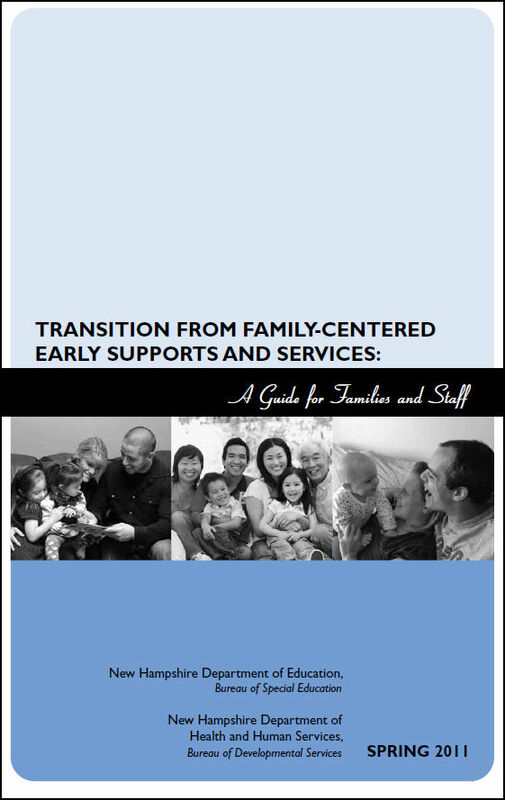 Family Centered Early Supports and Services (FCESS) is NH’s early intervention system. FCESS serves children birth to age 3 that have a developmental delay, an established condition or are at substantial risk for a developmental delay. Services are delivered statewide through the Area Agency system, administered by the Bureau of Developmental Services of the NH Department of Health and Human Services. FCESS services are provided in a child’s natural environment (typically the home or child care setting) by qualified professionals such as physical therapists, occupational therapists, speech pathologists, and early childhood developmental specialists. The activities your child does and/or enjoys everyday are used to help your child learn. Having fun and building relationships through play is an important part of the services and support that FCESS provides. Anyone who has a concern about a child’s development can make a referral to Family Centered Early Supports & Services (FCESS), including, and especially, you, the parent. If someone other than you makes the referral (i.e, your child’s doctor), you will be notified that a referral has been made and will be asked for consent to proceed before any evaluations are done or services provided. To make a referral to the FCESS Intake Coordinator at your Area Agency. Local Area Agencies are responsible for providing FCESS services. Sometimes as parents we are unsure of whether or not we should make a referral or if there “really is a concern”. Parents should feel comfortable in trusting their instincts and just as comfortable contacting FCESS to help in better understanding their child’s developmental needs. Once a referral has been made (once the phone call has been received by the Area Agency), FCESS has 45 days to complete an evaluation, determine eligibility and, if your child is eligible, develop an Individualized Family Support Plan (IFSP). My child is going to be 3 years old, what happens now? It is important to know that once a child turns 3, they are no longer eligible for services under FCESS and those services will stop on the child’s 3rd birthday. Once a child turns 3, there may be community-based services that can support a child’s and family’s needs including community preschool programs, outpatient therapy programs and continued Area Agency services. Some children may qualify for preschool special education services from their local school district. Not all children who receive FCESS qualify for preschool special education. As part of the ‘Transition Planning Process’, a family’s Service Coordinator will discuss these options with a family and help to review and plan for options that may be available. To make sure that there are no gaps in services, a Transition Plan will be developed and included in the IFSP. Planning for transition begins when the child turns 27 months, or earlier if they are found no longer eligible for FCESS, or as soon as possible if a child enters FCESS after 27 months of age. 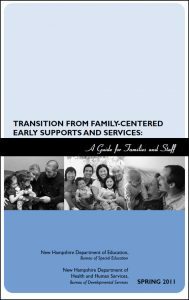 Transition from Family Centered Early Supports and Services: A Guide for Families and Staff (Also known as the Blue Book). An insert was created in 2017 to provide an overview of recent changes to the transition process.The insert is intended to accompany the Blue Book. My Child is 4 years old and has just been diagnosed with ASD. Where do I go for help? Parents should contact their local school district and ask for assistance in identifying services your child may need. New Hampshire has a long history of providing a free, appropriate public education to children with disabilities, ages 3-5. By federal and state law, local school districts must work with families and community partners to find, identify and serve children who are eligible for special education and related services so that services can begin by the child’s third birthday. An Individualized Education Program is developed for each eligible child based on the child’s strengths and needs. Placements may include the child’s home, local private or public preschool/kindergartens, or Head Start programs. Resource: Schools and School Administrative Units (SAU) in the State of New Hampshire including addresses, telephone numbers. Parents talk about how Early Intervention helped them understand and help their child. This video was done by NH Family Centered Early Support Services (FCESS) in 2016 and highlights a family whose child was born hard of hearing. It models the parents involvement in the early intervention process.